It took me about a month to finish this book. This was as a result of reading Big Magic and Why Not Me? in between. This is one of those books that throws you entirely off guard into a different continent. This time, Asia – pre/post WW11 Japan. 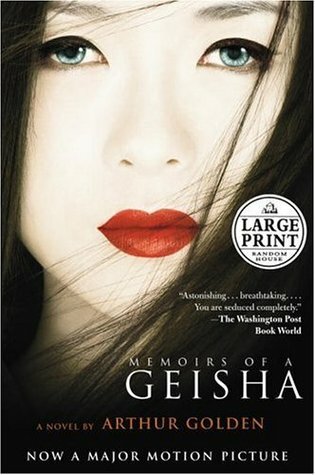 It’s basically a memoir about the life and times of a fictional geisha loosely based on a veteran geisha. Geishas are entertainers. Although I had issues distinguishing them from prostitutes. Except there’s a difference. During the course of book, the difference was clear as they made references to prostitutes. Geishas are more dignified artists/entertainers who possess skills in dance, music, tea ceremonies and whatnot. Also, they’re required to be knowledgeable to some extent. The only thing that doesn’t particularly sit well with me is their absurd culture of bidding the mizuage – the virginity of the geisha to the highest bidder. It’s just wrong. Although, I read that it has been banned in recent times. It took an awful long time for me to finish even by my standards. It just keep on going and going. It felt like the story could have been compressed. Then again, it took years of research to accomplish this project which became a bestseller – It has about one million ratings on Goodreads. So, I can’t really fault it. The most shocking part of it all is that it was written by a man – Arthur Golden. Yeah, I had a hard time coming to terms with it because it was so beautiful, intricate and intentional. You know how we’re used to certain spectrum of fairytales? This was totally unexpected. I didn’t see it coming. On the other hand, I expected a mainstream and cliché rags to riches storyline. I mean, she was taken from her family at the age of nine and was sold into slavery – as an apprentice geisha this time. She eventually became a successful geisha, retired and immigrated to New York where she set up her teahouse. But in the midst of all this success, she wasn’t happy. The love of her life was far from her reach. At the end the odds worked in her favour and the twist of events were just incredible. Another notable thing is that the book is an American novel. It was so easy to get carried away. It was like a formal introduction into the Japanese culture. I want to read more books like this. The language was simple and easy to understand but incredibly slow. Oh, I thought we were huge on (costume) fashion and makeup but the geisha makeup is incredible with their signature red lips. This is one of those books that left a lasting effect on me and I cannot wait watch the movie. I read the book years and years ago!!! And I really enjoyed the movie too. It was one of my faves for a long time.